Outlook Delay Delivery not working out? 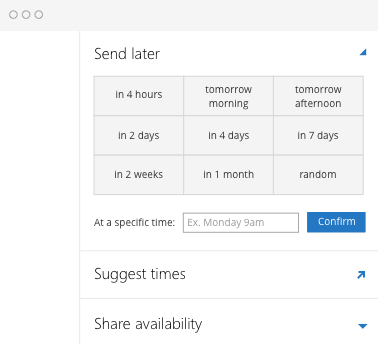 Here's a better way to schedule email in Outlook! Delay Delivery has met its match. Boomerang for Outlook's send later feature lets you write a message now, then have it delivered at a time of your choosing, without needing to keep your computer on. Try it out today on Outlook 2013, Outlook 2016, or Outlook on the Web! I love Boomerang for Outlook! Keep making great products! Managing all of your scheduled emails from any internet-enabled device, even if it doesn't have Office. Not having to worry about keeping Outlook open or connected to the internet for a message to send. Scheduling and managing emails the same way on Outlook 2013, Outlook 2016, and Outlook on the Web. Outlook's Delay Delivery has long been the way to schedule an email for later, but the feature is hard to access, makes it difficult to manage multiple scheduled emails, and often requires you to keep your computer on and connected to the internet to actually send an email. Boomerang for Outlook avoids all these shortcomings and provides a powerful, quick, and integrated way to schedule emails in Outlook 2013, Outlook 2016, and Outlook on the Web, all without leaving the message you are composing. P.S. Boomerang brings similar functionality to Gmail and Google Apps too. Learn more about Boomerang's Gmail Delay Send feature!